In every career, having goals is an important part of growing and thriving. As a nanny, whether you’re a career nanny or are only nannying part-time, setting goals is of the utmost importance. From small goals to big goals, short term ones to long term, we’ve compiled a list of websites that will help you achieve all of the goals you set, and maybe even some you didn’t! Setting goals is the first step to turning your dreams into reality. It’s becomes harder to move forward as a nanny without goals because you haven’t defined what it is you want to accomplish throughout your career. For more reasons why you should set goals, turn to these 10 sites. Goals help you know where you are headed. Positive Thinking Principles explains that goals give you motivation because they define what it is you want to achieve. Achieving goals helps improve your confidence. Goal Setting for Success discusses how setting and reaching goals makes you feel successful and accomplished. Goals turn dreams into accomplishments. Resolutions RTK says unless you turn your dreams into goals with actionable items, you will never accomplish them. Setting goals helps you determine what you want. Michael Wyatt points out that people who don’t set goals wander aimlessly through life and don’t know why they lack fulfillment. Setting goals helps you move forward. Keep Inspiring Me explains the importance of setting a deadline for achieving goals. Having a date to achieve them by helps motivate you to reach them. Without goals you may end up where you don’t want to be. Life Hack urges people to set goals and review them. Otherwise, you may wake up one day and realize you aren’t where you want to be. Make specific goals that mean something to you. Get Level Ten says that you must have an emotional attachment to your goal to be successful. Make goals that are worth the effort. Leaving Work Behind advises you to think about the goals you set and make sure that they are worth the effort required to achieve them. Having goals can help you stop procrastinating. Clint Maun explains that goals give you direction. Try to make your goals big because little ones will not inspire you. Purpose Fairy points out that dreaming big is what drives people to achieve their goals. Long-term goals are the things you want to achieve a year, five years or even 10 years down the road. When brainstorming your long-term goals, focus on your big dreams and determine which ones you want to pursue. While it’s okay to have multiple long-term goals, you always want to make sure you don’t have so many that the prospect of achieving them becomes overwhelming. 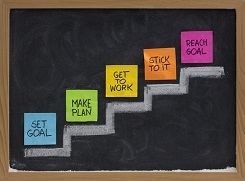 For tips on setting long-term goals, check out these 10 posts. Set a goal that is challenging, but doable. 2 Know Myself explains that making a goal too hard can deter you from achieving it. Brainstorm ideas. Strength of Us recommends brainstorming ideas of what would make you happy in all aspects of your life. Envision your ideal future. HR Web Berkeley suggests thinking about different aspects of your life and envisioning what you would like them to be like. Create financial goals. Capital One explains how to set up financial goals and how to realize your long-term goals. Learn how to keep track of your long-term goals. Coach Amal explains the importance of keeping your goals posted where you can see them. Make sure your long-term goals are feasible. ALC Web Marketing points out that it’s simple to say you want to retire on a beach somewhere, but you need to make sure that you can aactually make that happen. Read how to set a long-term goal. Runner’s World shares how to set a long-term goal and why it’s important to think beyond the next race. The tips in this article aren’t just for runners; they easily transfer to all aspects of life. Create a vision board. Sometimes it’s helpful to have a visual representation of your long-term goals. Greg Beazley explains how to create an online vision board. Make a dream board that you can hang on the wall. Goal Setting Guide gives tips on making a dream board using a cork board, images and more. How long do you want to be a nanny? Go Nannies advises nannies and employers to discuss long-term goals with each other so that you both are able to plan for the future. Once you’ve set your long-term goals, it’s essential that you then break them down into smaller goals. These short-term goals make achieving your long-term goals much more feasible. They also allow you to celebrate mini-successes as you work towards your long-term goals and keep you motivated. Read more about breaking down long-term goals in these 10 articles. Learn how to create short-term goals. Decisive Minds explains how short-term goals can seem more accessible than long-term ones. Make your goals small enough that they seem achievable. Udemy points out the importance of breaking down your goals until they’re something you can work on right now. Determine what your core values are when deciding on short and long-term career goals. Forbes explains the various ways you can evaluate your career skills and utilize them as you work towards your goals. Figure out the steps that you need to take to reach your long-term goals. No Ordinary Homestead details how to break down big ideas into baby steps. Help your charges set school goals. School Family describes how kids can break down larger goals into smaller ones. Turn steps into short term goals. Breaking down your long-term goal into steps isn’t enough if you don’t turn those steps into short-term goals, explains Career Path 360. If your long-term goal is concrete, you can break it down into action items. Lifehacker explains the importance of making your long-term goals concrete so that you have the ability to break them down into smaller milestones. Learn how to dissect your goals. Self-Learner points out how to look at a long-term goal and figure out how to break it down into smaller pieces. Come up with mini goals. My Personal Best explains the importance of determining how realistic your long-term goals are so you are able to create mini-goals. Make sure your goals are explicit. Virtual Learning Lab has a brief online class that explains the difference between implicit and explicit goals and shares how to break them down once they are explicit. Incremental goals can be the same as short-term goals, or they can be different. These types of goals define the next step you need to take to reach your long-term goal. If you can step closer and closer to your short-term goals, you are able to celebrate success sooner. These 10 sites explain more about incremental goals. Whittle down your long list to three long-term goals. Harmony from the Inside Out urges you to reduce your brainstormed list of goals down to the three that will make the most difference in your life. Once you’ve done that, reduce those to incremental goals. Set short-term goals that are well-defined, incremental and doable. After you break down your long-term goals into short-term ones you need to make sure that the short-term goals make sense and motivate you, says Fit Day. When setting short-term goals be specific. Company Founder explains that you need to know exactly where you have to be in order to know when you reach your short-term goal. Incremental goals are mini milestones you can celebrate. Everyone needs encouragement and setting incremental goals allows you celebrate your achievements, explains Shape. Incremental goals are even smaller than short-term goals. Toastmasters details that your short term goal may be to lift weights three times a week, but your incremental goal defines how many reps you will do at each weight machine or exercise. Avoid burn-out by making incremental goals. Edutopia explains how common burn out and frustration are when working towards bigger goals, which is why you should add an activity that allows you to see success. Incremental goals can also mean to move up as you going along. Core Performance describes how you can start with goals that are easy to achieve and then work towards harder goals as you move closer to your long-term goal. Make sure your goals are achievable by determining incremental goals. Titus 2 Homemaker points out that running a marathon may be a smart goal for you if you’re already a runner, but may not be if you are significantly overweight or inactive. Know when incremental goals may be holding you back. Chief Executive says that people often make incremental goals without having a long-term goal that they are working toward. Achieving a small incremental goal doesn’t mean as much if it isn’t attached to something bigger. Make sure that you have to put in effort to reach your incremental goals. Music Clout points out that when you set incremental goals it’s important to make sure you have to put forth effort to achieve the goals you’ve set to feel a sense of accomplishment. Every day you should do something that takes you a step closer to your long-term goal. Make a plan to reach your goals and then define what you can be doing daily or weekly to achieve them. The following 10 articles will help you make a plan to achieve your goals. Tricks to staying committed to your goals. Pick the Brain explains the importance of having a plan in place that keeps you on track to achieve your goals, especially after your initial excitement about the goal wears off. Break down tasks. Aggie-Horticulture shows how to break down tasks into daily, weekly and monthly To Do lists. Be flexible when forming your plan. Money US News urges you to make a plan for how to achieve your long term goal, but also stresses to be flexible because you don’t know what the future holds. Come up with a career plan. Many times goals are career-oriented, so use the tips on I Seek to learn how to create a career plan that you can stick with. Learn how to form a MAP. Training Tony Robbins explains how to form a MAP, or Massive Action Plan. A plan can help you determine causes and effects. Business Balls encourages you to use methods that you enjoy when setting up a plan. An action plan can help you determine the benefits of achieving your goal. Kent details how to form an action plan and define the steps needed to reach your goal. If-Then planning can help you reach your goals. 99U encourages you to write down steps with the IF-THEN approach. IF one thing happens THEN you will do something in response. Asking the right questions can help you create an action plan. The Right Questions says that answering why, where and what can help you form a plan. Write down your goal and then make a list. Goals on Track explains that by making a list of things you need to do to reach your goal you can start to determine your action plan. Over time, it can be hard to keep plugging away at a goal, so it’s important to find a way to be excited about your goal every day. You can do this by creating a vision board that you can look at each morning. Know why you want to achieve your goal and keep that in mind as you go about your daily life. Share your goals with other people and let them help you stay motivated. These 10 posts will help you figure out what will keep you motivated as you work towards your goals. Tell your friends or family about your goals. XO Sarah lists 101 ways to stay motivated as you work towards your goals. Stay happy. While it’s impossible to be happy all the time, David Mansaray explains that to be motivated you first have to be happy. Make a list of reasons you want to achieve your goal. Growing in His Glory says that you can stay motivated by reviewing why you wanted to reach a certain goal in the first place. An object in motion tends to stay in motion. Spark People describes how momentum helps you stay motivated, so you need to keep moving toward your goal every day. Be passionate. If you are excited about your goal, you are able to stay motivated. Motivade explains that having a passion is often enough to keep you going. Imagine how you’d feel if you didn’t accomplish your goal. Sometimes you can motivate yourself by avoiding negativity, explains Inspiyr. Have fun. Shine Yahoo encourages you to make reaching your goals fun. You’re more likely to want to continue to work towards something if it’s enjoyable to do. Make sure you have small enough mini-goals. Goal! Your 30 Day Game Plan urges you to break your goal down into short-term goals that allow you to experience success. Avoid making excuses. WPS Pearson expands on the idea of developing self-discipline to stay motivated toward achieving your goals. Make the steps simple. The Change Blog explains that if you are trying to save money, have it automatically transferred into savings each pay period. You will encounter periods of time where you feel like you aren’t making any headway towards reaching your goals, despite the effort you’re putting in to do so. Keeping track of your progress will help you avoid feeling like you haven’t achieved anything. These 10 sites list ways you can track your accomplishments so that you stay motivated. Use Google Calendar to track your progress. According to Dumb Little Man, you can use this program for more than just To Do lists. Get together weekly with a group to discuss progress. Buffer App explains that weekly dinners are one way a notable company holds team members accountable. Try using Joe’s Goals online. You can track as many goals as you want and even share results with friends, explains Joe’s Goals. Use a free service called 42 Goals. This is a daily goal tracking service that you must go on and update every day in order to see a benefit, says 42 Goals. Track more information by buying an online service. Goals on Track has several ways to keep you on track, though it does come with an annual price tag of $68. Microsoft Project is a way to use something you may already have. Office Microsoft explains the steps you need to take to get this program to track projects versus your schedule. Week Plan is a program that lets you track your progress online. Work Awesome points out that this program is based on the concepts from 7 Habits of Highly Effective People. Some online trackers include a coach to help you reach your goals. Mashable recommends Move Mountains to set daily, weekly or monthly goals and create motivators. Write down your goals and check them often. The Latter Day Saints explain that people who write down their goals and refer back to them regularly are more likely to see success than those who don’t. Use a basic calendar to track progress. Don’t Break the Chain is a method of tracking progress used by Jerry Seinfeld where you put a check mark on the calendar every day that you work toward your goal. You don’t want to break the chain of check marks, so you are more likely to keep up with it, says Divine Caroline. You don’t have to work at achieving your goals alone. In fact, having a support system in place can make all the difference when it comes to achieving them. Read these 10 blogs for tips on getting help with your goals. Get a goal buddy. Small Business Info Canada explains how having a goal buddy will keep you accountable. To achieve your goal you need to use your personal network. Institute for Community Inclusion explains what your personal network is. Use an online network of supporters. Zen Habits encourages you to tell people your goals on your blog and update them weekly so that you can get encouragement online. Ask someone you trust. Site Point knows that your motivation may wane, so ask someone you trust to encourage you. Find a mentor. And Then We Saved points out that having a mentor can help you reach goals in specific areas because they have been there before and can help you get there. Tell your friends and family about your goals to enlist their support. Diatribe explains how to be successful with your goals by finding support. Find a support group. Add My Support has links for many different online support groups based on the topic of the goals. Seek those that want to build you up. Family Share advises you to avoid people that want to tear you down and spew negativity in your direction. Get together with other people with the same goals. Lemon Lime Adventures talks about how she links up with other bloggers to compare goals and support each other. Find a coach who can guide your efforts. Top Achievement says having a coach to help you achieve your goals is essential. You should always plan for setbacks when setting goals. Doing so will help you be prepared should something happen. After all, it is highly unlikely that your entire goal journey will be without setback. Read these 10 posts to help prepare for any setbacks you may face. Don’t be too hard on yourself. Better Health explains that it’s important to celebrate what you did accomplish, even when you don’t reach your goals on time, and keep plugging away at them. Keep positive messages in your mind. Top 3 Goals urges you to prepare for setbacks by having positive mantras you can use to improve your mood and to surround yourself with positive people. Prepare for setback and learn from them. David Weedmark says that if you are not encountering setbacks then you are not trying anything new. Assess any setbacks that arise and then move on. I Seek points out that everyone is going to encounter setbacks, but it’s how you deal with them that will set you apart from the rest. Stay focused on your goal, not the setback. Expert Beacon reports that those people that succeed are the ones that learn to handle setbacks and then move on. Have a plan in place to deal with setbacks. Setbacks are so common that J 2 Jenkins suggests planning for them and deciding ahead of time how you will handle them when they inevitably happen. Learn from your setbacks and move on. Ask Dr. Susan shares that setbacks are inevitable; when you encounter one, figure out what went wrong and try not to let it happen again. Setbacks are not failures. No path is completely without bumps and no goal journey is without setbacks. It’s important to deal with them and move on instead of throwing in the towel, encourages Worldwide Health. Make sure you know where you’re going and that a setback won’t derail you. Master Your Brand explains that those people who have a clear vision don’t allow a setback to make them stray from their vision, but those without a clear vision wallow in the setback. Don’t be afraid to rethink your goal. If you find you are having too many setbacks, you may need to reassess your goal and make adjustments, advises Psychology Today. Rewarding your accomplishments, both big and small, is an important part of staying motivated. Determine your rewards ahead of time, that way you have something to look forward to when times get tough. These 10 posts will help you determine how to reward your accomplishments. Dangle a carrot for yourself and you may just reach your goals! Small rewards still motivate. Life Script shares how you don’t have to spend a ton to reward yourself. Reward the smallest steps. Crystal Tatum explains that small rewards may help you get started on a difficult goal. She lists over 100 rewards you can use. Hang a picture of your reward to motivate yourself. Jill Conyers created a vision board that had a picture of her reward right in the middle of it so that every time she wanted to slack off she would think of her reward and keep going. Rewards tie small achievements to joy. Early Riser explains that you connect taking the right steps to something positive when you reward your efforts, which makes it easier to keep moving forward. Make sure that your rewards don’t undo what you achieved. If you are trying to save money, don’t spend money to reward yourself. If you are trying to lose weight, don’t reward yourself by going out to dinner. Action Podcast advises that you reward yourself appropriately. Rewards must be personal to you. What motivates one person may not motivate you. Campfire Chic asked several people how they reward themselves so you can get some ideas of what may motivate you. Your reward must match the accomplishment. If you hate exercising you may want to reward yourself for getting out the door and taking a walk. Just make sure your reward matches your accomplishment, suggests She Inspires. Why are rewards important? Fit Day explains that rewards can motivate you to continue working toward your long-term goal, add fun to the struggle, give you mental strength to hang in there and more. It’s important to set your reward at the same time you set your goal. Transition of Thoughts explains that if the reward is to drive your efforts you have to know what it is ahead of time or it won’t help. Ideas for various non-food rewards. Visalus 4 Your Soul categorizes rewards that you might like when you are trying to think of ways to celebrate reaching a milestone.